Is Casey Stoner Returning to Ducati Next Year in a Testing/Racing Role? 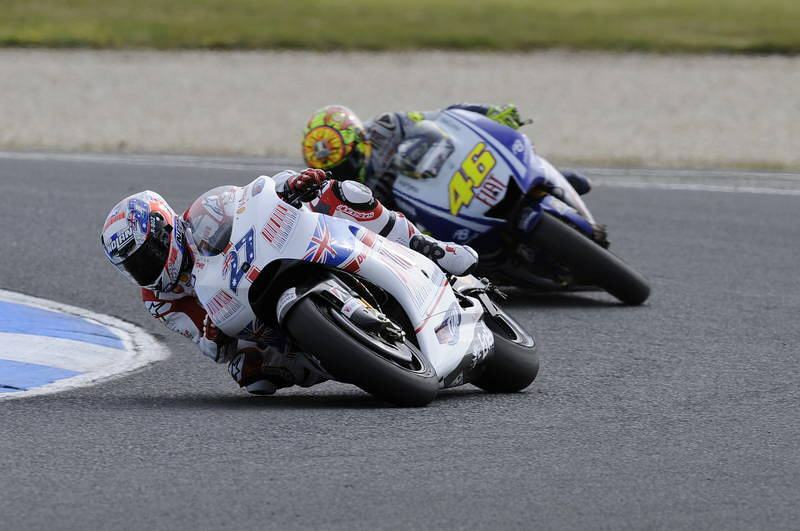 Casey Stoner’s Ducati leads Valentino Rossi at Phillip Island in 2009. Retired two-time MotoGP champ Casey Stoner, who has been serving as a test rider for Honda for the past several years, is moving over to Ducati effective January 1 according to multiple reports. What started out as a paddock rumor is now being treated as a virtual certainty by some journalists that travel with the MotoGP series. Stoner’s relationship with Honda may have soured somewhat due to recent events, including Honda’s refusal to let Stoner substitute for Dani Pedrosa during the Austin, Texas round earlier this year, and Stoner’s heavy crash aboard a Honda superbike at the Suzuka 8 Hour race. The Suzuka crash caused some significant injuries to Stoner and resulted from a stuck throttle … something that Honda acknowledged and apologized for. Ducati might be more liberal when it comes to allowing Stoner to participate as a wild card in future MotoGP races. Don’t expect any official announcement from Stoner or Ducati until after his Honda contract expires on December 31. This is great for MotoGP. No one should be alllowed to have a test rider that could win races at the same time. This will hurt Honda and level the playing field. I don’t have proof, but something tells me that Honda already knows that Stoner’s motogp competency and willingness to put life and limb on the line to win just wouldn’t justify a factory ride. It’s hard to see him accepting a ride with a satellite team. At this stage, I doubt he’s even as fast as Dovi though surely less error prone. I think Honda was afraid that he would win and Ducati hopes and thinks that he can win. Was and more than likely still faster than Dovi. It will be good to see him mix it up with Lorenzo and Marquez and maybe Rossi if he can keep up and to show all how to ride a Ducati properly once again. Maybe Stoner is looking for an excuse to escape from the whining of his wife. Joke. If Casey ever does come back full time, I want him paired with Marquez on the Repsol Honda squad. That would be a beautiful thing. As in, Hieronymus Bosch beautiful. Wonder what happens if Stoner turns consistently faster times than the Andreas? As the slower of the two current riders at the moment, I suspect Dovioso is the one that would need to be a little worried. Agreed Iannone was pretty spectacularly fast this year. Stoner might be faster, but he won’t leave him for dead. Not sure what happened with Dovi. Iannone just needs to not crash. Correct me if I’m wrong. But, did not Troy Baylis do a wild card on Ducati for a MotoG and win the race? Or, was it WSB? My memory leaves me stranded at times. Ohhhh so true, but think about how much money many of us save on our physiatrist bills by whining about something on every topic….plus the satisfaction gained on the sheer torture and discomfort this causes others here. Ahhhhh….not that I have any personal experience in these matters!!! Sorry….my post above was a reply to Jeremy on the following he did November 11, 2015 at 4:31 pm. Look what he did with the duck in the past. If the Andreas can make it a fair machine then he can make it a winner. At least a wild card in Australia would be epic. Audi : Why did we not win the championship this year ? You guys had a fast bike, we saw it on TV, at Philip Island our bike was a rocketship?? Ducati : Our riders are good but we don’t have Rossi or Lorenzo…. Audi : Who can win on our bike? Ducati : We can call Stoner? Audi : Do it. DO IT !! Stoner is coming back to Ducati as a test rider. Honda has DBW, so their “stuck” throttle, I don’t know what that meant, but it wasn’t a mechanical fault I’d bet. What happened I doubt if they will ever acknowledge. I wonder how fast the Duck will be when they take away the fuel and tire advantages. As an Aussie, if he does come back into MotoGP, I say to Casey; For Christ sakes stop your bloody whining! I don’t think you can do this sport “part time”. Either in or out Casey. While Ducati is clearly the fastest bike in a straight line, they have considerable work to make it a MM beater..
Had Iannone not crashed out of 3 of the last 4 races it might have been a MM beater. Might have. Well, if there was any doubt about purchasing the MotoGP video package next Spring, there isn’t now! I would love to see Stoner come back, many of us missed his whining. Motorcycle racing should be open to women equally. Not to worry: there is still plenty of whining going on without Stoner. +1. A certain GOAT has been heard to complain recently. While I respect HRC, their ingrained ‘machine, not rider’ outlook has always caught them out from time to time. Stoner’s advice to HRC that the engine response on the RCV was just too explosive (imagine if that what Stoner thinks, how fierce is it?) was not taken, then they sweet-talk him into the Suzuka 8 Hours, only to throw him into a serious accident with a stuck throttle on one of the most moto-unfriendly tracks on the planet. How the hell do the best-of-the-best HRC crew send him out with a sticky throttle? After watching this year’s Duc boat-race everything on the straight at the COTA stop earlier this year, this could get interesting . . . . if it’s not a ploy by him to bend HRC to his way. Good Luck . . . . Wonderful! Now Stoner and MM can pick on Rossi. One has to wonder what Honda was thinking. Seeing Stoner back on track in Red (even part time) would be great. OMG looks like Stoner was holding VR46 up so that countryman Chris Vermeulen could catch up and gain valuable championship points!!! At least you admit it!!!!!!!!! Uh oh, Dovi. Better bring it next year, man! Hope Casey can make the Ducati even more competitive. Honda is still using the 2014 chassis with the new motor for this season. Doesn’t look like Honda doesn’t have anyone to tune their chassis. I think if there is anyone out there that could get the Duc in shape it is Casey.